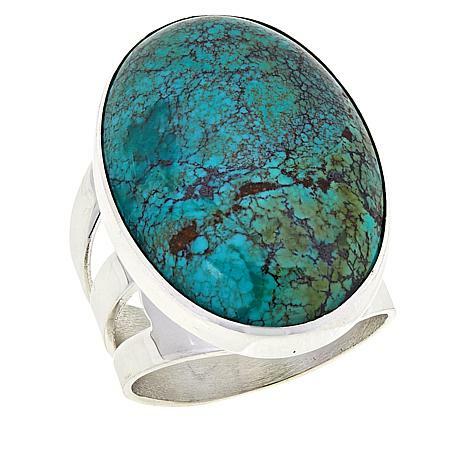 Bring a beautiful touch of natural turquoise to your hand with this oval-shaped ring. 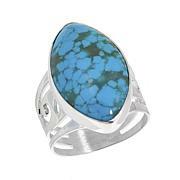 It features a polished cabochon of Hubei turquoise with a distinctive dark matrix. The resulting piece is as individual and unique as the woman who wears it! I love wearing at least one big ring. 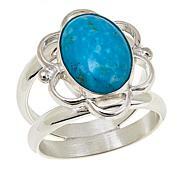 Knowing that this ring is "Antique" Hubei Turquoise makes it extra special, like I'm holding onto a part of history. 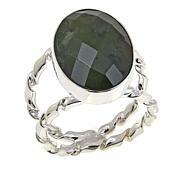 Beautiful blue green stone. Wow! So pleased with my ring. I received a high blue with about 2/3 black matrix. Stunning! Ordered a size up, fits perfectly. Jay king did not let me down with this sizeable beautiful turquoise ring . I always enjoy his pieces. I love the modern design on the band. My piece has a lot of the black in between the turquoise. I also bought the necklace and the other ring that kind of reminds me of a beetle. 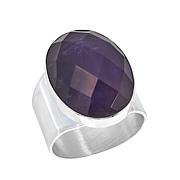 Not only is this ring pretty to look at it is very comfortable to wear. Blue/green with matrix. I love to wear it.